We now offer Program-Pairings, perfect for a full-day experience! These programs complement one another, with the second program reinforcing the lessons learned in the first program. Pair your two favorite programs for a FULL DAY of meaningful and high-level learning! In this competitive 2-part series, points earned and the items found during the fun and exploratory Smart Hunt will be directly transferred to Corporate Survivor! Will you be in the lead going into the afternoon showdown or will your team showcase survivor comeback skills and steal the day (and the gold medals!)? What’s better than having your team build an amazing cardboard and duct tape bridge which visually represents the goals and future aspirations of the organization? By following that up with building a small fleet of Green Machines and racing them around the room and over the bridge while vying for gold medals! While the bridge will need to be strong enough to support the entire group for pictures, the Green machines will be donated to a local non-profit organization for children in need!! Do you have a group that loves direct No-Holds-Barred competition? Then we have a double dose of “Bragging Rights for the rest of the year” right here! Start with an Olympic-style event replete with relay races and assorted beach or field activities. Now take the points that each team earned and move it indoors for the cerebral challenge of the infamous Game Show Mania! Can your team demonstrate the physical AND mental prowess necessary to win the gold medals and championship status!? GAME ON!! Imagine a fun and fast-paced rotating table-top activity session which will have each participant interacting and enjoying the company of their associates while getting to know each other better. Now those team members become part of a competitive project. 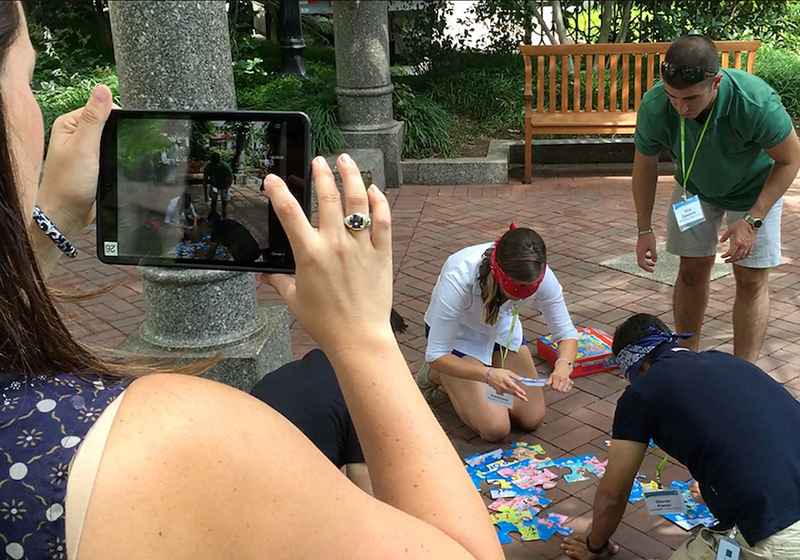 In a communication skills showdown, teams must figure out how to replicate an existing pre-assembled structure which only one of their team members can actually see! Going beyond a typical “classroom style” experience, our energetic and experienced facilitators will create a fun and interactive environment while imparting numerous tips on key topics such as efficiency, handling urgent matters, and pre-planning as lessons for participants to apply to their work day. Followed by a rich and interactive experience with activities which challenge the group and showcase high-performing team attributes including goal setting, role clarification, and meeting management. Please note, these are samples of programs we recommend pairing. Many other Program Pairings can be created to suit your group’s goals and objectives.